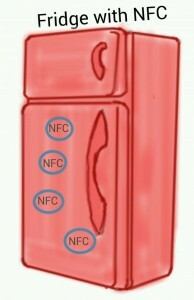 Just stick some NFC tags to your fridge or on the back side of the remote control of your TV. With the NFC task launcher on your Android phone the apps of your favourite pizzeria or any other fast food restaurant will start. If they offer no app then you store the URL of your pizzeria on the NFC tag. A clever app like NFC task launcher – will combine everything. Each evening it can start the soccer channel, start WI-FI direct to stream the content to your TV, power off the ring tone of your Android phone, order pizza and beer and dim the light in the room.